Analysis: Is the Obamacare tax penalty really dead? They’re right – and wrong. Not so. The penalty won’t go away until 2019, and that means you still will owe Uncle Sam if you didn’t have health insurance – or an exemption from the mandate – in 2017. The same holds true for this year. One client, a family of four in Orange County, Calif., decided to go without insurance this year, and will owe about $15,200 next year because of it – roughly the same cost as a bronze-level health insurance plan that would protect them from catastrophic health insurance bills, Stasoiski says. The IRS says that this year, for the first time, it will reject electronically filed tax returns that don’t address Obamacare tax penalty questions. On the other hand, you must have a correct 1095-A to complete your taxes. 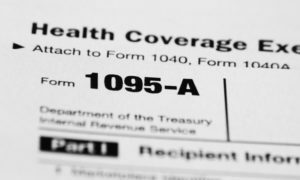 If you’re a Covered California enrollee – or buy your insurance through any state or federally run health insurance exchange – you should have received your 1095-A forms by Jan. 31. If you can’t afford it, multiple programs offer free tax help, including the Volunteer Income Tax Assistance (VITA) program, run by the IRS (www.irs.gov/VITA) and the AARP Foundation Tax-Aide program (www.aarp.org/findtaxhelp). This story was produced by Kaiser Health News, which publishes California Healthline, a service of the California Health Care Foundation. Kaiser Health News is an editorially independent program of the Henry J. Kaiser Family Foundation, a nonprofit, nonpartisan health policy research and communication organization not affiliated with Kaiser Permanente. You can view the original report on its website.